Once in a blue moon a product that enters the market that is game-changing – it transforms how people communicate, how they receive services, and how they work. Then sometimes, you get a product that comes close to that kind of success but falls short because its potential is hamstrung by a couple of flaws. That is the Rocket Hub in a nut shell. Rogers Communications Inc. is selling the device with the promise of “Internet and Phone in one solution for your home or office from $35 per month.” But that cost would only apply to the most casual of Web surfers – the sort of person that wouldn’t buy this product anyway. The Rocket Hub is incredibly simple to set up and start using. 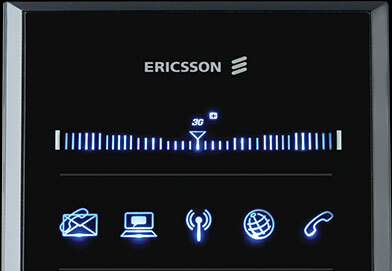 Basically, you plug the device into an outlet and within a couple of minutes it is connected to Rogers’ HPSA 3G+ network and you’re ready to connect your devices. Each hub has a key associated with it for security, and you type that in to your WiFi security settings on each device you want to connect. 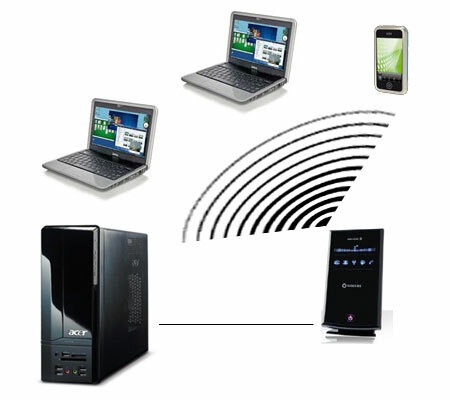 You can connect up to 10 devices at a time using both Ethernet cables and WiFi connectivity. There’s also a phone jack that allows you to connect any typical landline phone and receive cellular calls on it. I was set up and ready to go with my home network within minutes. Above you’ll see a visual representation of my set-up. I used an Ethernet cable to connect my media centre desktop, and had two laptops and an iPod Touch connecting via WiFi. The performance of the Rocket Hub was consistently good and fast. I never experienced any downtime due to loss of network connection, and the broadband speeds were impressive. Rogers advertises download speeds of up to 7.2 mpbs and I’d say that is realistic. This service was often faster than my DSL broadband connection that is advertised at 5.0 mbps downstream. One laptop that was furthest away from the hub seemed to have a slower connection than the others. I’m not sure exactly why, but it could have been that the WiFi signal from the hub was too weak. Oveall, it was excellent for all forms of Web surfing. It could stream video, connect VoIP calls, and handle P2P traffic. But can you afford to pay for it? Rogers has created unique plans for the Rocket Hub device. It’s a tale of two services in this case, with appealing voice options, and data plans leaving a lot to be desired. Plans start at $50 a month and all of them include unlimited local calling, voicemail, caller ID and call waiting. That’s a pretty good deal that could replace home phone usage in many scenarios. There’s also an option to add on unlimited calling in Canada for $20 per month. The $50 price allows for up to 3 GB of transfer per month. For $60, you get up to 5 GB per month and for $75 you get up to 10 GB per month. With the portable nature of the Rocket Hub being its greatest asset, it’s disappointing there is no battery add on for the product. 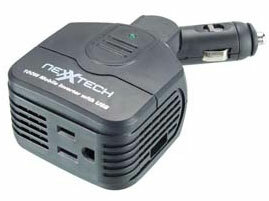 The user must always be plugged into a wall outlet in order to link up with the Web. If there were a battery feature that stored even a couple hours of charge, it would turn the Rocket Hub into a much more versatile device. You could throw it in your brief case and access your e-mail while you ride the bus, for instance. The pricing structure for data is also a disappointment. This device could easily be a staple for in-home communications – with customers running both voice and broadband Internet services through it. But almost everyone will download more than 10 GB a month these days, which is the maximum covered under a plan. Finally, having available stock would be a plus. At the time I’m writing this, the product is sold out on Rogers’ Web site. While I was testing the Rogers Rocket Hub, it occurred to me that I could install the device in my car. The idea of in-car WiFi was too appealing to pass up. Using a simple power adapter that converts the DC power from my cigarette lighter to a standard 12 V AC wall outlet, I plugged the Hub in and was ready to go. Driving around the GTA, the hub stays connected to the cell network just fine. I was able to stream music over my iPod Touch and even make Skype calls (hands free of course). This kind of adapter allows you to plug in the Rocket Hub to your car’s cigarette lighter. Imagine having a carpool where your colleagues could actually get work done on their laptops in the morning. Or entertaining the kids on a long drive with a movie streamed over the Web. Cars with built-in WiFi service are starting to come to market and it will soon be just one more feature you can add when buying a new car. But if you don’t want to wait for the car of the future, this is an easy way to turn any car into a WiFi on wheels-mobile.